Your health information on your terms. Multiple EMR and EHR systems exist today resulting in high maintenance and operating costs for providers particularly. There is a struggle for standardization across these systems and only a few standards exist on the payer side (e.g. diagnosis and procedure codes). If a patient changes providers or sees multiple providers, often their health information is inconsistent at best and more likely resulting in very incomplete or inaccurate medical history. Our vision is for patient-focused and patient-controlled connected health records: a healthcare ecosystem where the patient is the heart of the public network and invites all other healthcare stakeholders to participate in support of the patient's health. This system allows for the open registration of any healthcare participant be it patient, provider (physician, pharmacy, lab/diagnostics), research organization or government agency. 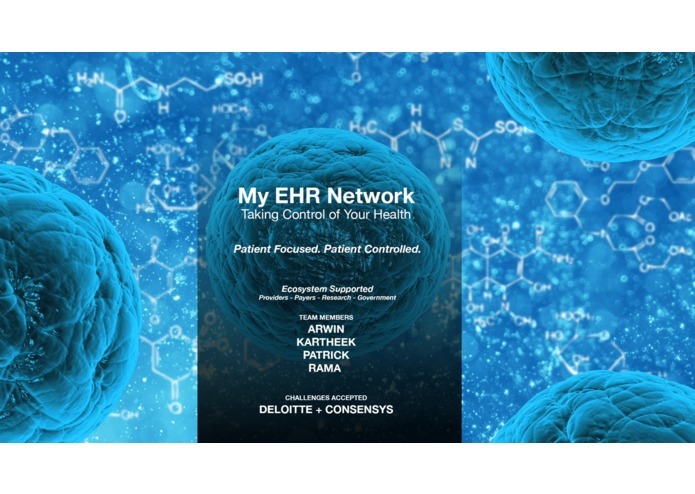 Patients ultimately control access to various parts of their electronic health record (EHR), established initially upon registration with PCP and Pharmacy selections and agreements to share non-personally identifiable information with research and government organizations; modifiable through patient's application settings. Other non-patient participants only see portions of the EHR that are relevant to them with various read-write abilities. Started with a fresh meteor installation and constructed all of the forms for creating and editing 6 unique types of users. Permissions and data access controls are managed through smart contracts done with Embark. Time time time. Lack of sugar. Merge conflicts. Maintaining patient-focus, further investigate market value and viable economic models for a self-sustainable network. Expand capabilities of the system to support more participants: other providers, payers, etc. Within the US (or other) market, launch a public pilot and obtain buy in / initial adoption from patient population and accelerator organizations such as large Pharmaceuticals or influencing payers such as Medicare / Medicaid.